1 - First Lensman by Edward Elmer "Doc" Smith aka E.E. Doc Smith (1950). Here Smith lays down the foundation for much of the next sci-fi and all space operas to come. Kim, young man from an agricultural planet, finds a dying man with a legendary crystal lens embedded in his hand. As the man was dying, he mysteriously passed on the Lens to Kim. Now Kim must find out the purpose of the Lens before the Boskone dynasty does. 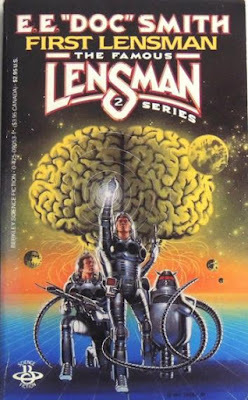 2 - Foundation by Isaac Asimov. The Galactic Empire has ruled supreme for millenia, but now it is dying. Hari Seldon, creator of the revolutionary science of psychohistory, can see into the future to a dark age of ignorance, barbarism, and warfare that will last thirty thousand years. To preserve knowledge and save mankind, Seldon gathers the Empire's best minds, takes them to the edge of the Galaxy to serve as a beacon of hope for a future generations. This sanctuary is called the Foundation. 3 - God Emperor of Dune by Frank Herbert. Wait, how can the Dune series be on our "grounded" list and our Space Opera list. Because it's that good, and it takes place partly in space ... partly on ground. And epic sci-fi tale that should not be missed. 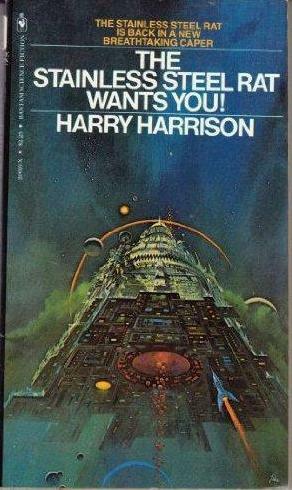 4 - Rendezvous with Rama by Arthur C. Clarke. There is a celestial object that astronomers call Rama. It is huge and flying through the solar system at great speed. Then a space probe confirms it is no natural object. Rama is an interstellar spacecraft. The world must prepare for mankind's first encounter with alien intelligence. 5 - The Star Web by George Zebrowski. Pulpy, but an incredible read. A UN research team finds a ship in the Arctic. The scientists are soon hurtling through space on an adventure that is as incredible as it is frightening. Zebrowski was a Nebula Award Finalist. 6 - Hitchhiker's Guide to the Galaxy by Douglas Adams. It's comedy, but it does indeed stretch and pull our imagination. 7 - Hyperion by Dan Simmons. On the Hyperion world is a creature called the Shrikee, and those who worship it, others who fear it and a few who have vowed to destroy it. On the eve of Armageddon, with the entire galaxy at war, seven pilgrims set forth on a final voyage to Hyperion seeking the answers to the unsolved riddles of their lives. And one carries a secret. 8 - Gateway by Frederick Pohl. Flying through an interstella void in a spacecraft is always a good idea. This one sings to me. 12 - Ringworld by Larry Niven. You get three-leg two-head aliens, and an eight-foot red-fur catlike alien. What more could you want? The writing is not great, but the idea is ground-breaking. 19 - The Stainless Steel Rat by Harry Harrison, a great series in space. Not award-winning, but a helluva lot of fun. So there you have it, space cadets! Get out on the open waves of the next galaxy and read some sci-fi in space. Not all space operas are alike, but they all have a common thread: they stretch our imagination.